Are you in the market for a new vehicle but aren’t sure which type to choose? If so, then it’s time for you to meet the pickup truck. Here are some highlights of pickup trucks, including reasons why you should own one. The functionality of a truck can be revolutionary, as most vehicles only take you from place to place. Trucks, on the other hand, are versatile, in that they are capable of hauling, towing, storing, and of course, driving. With the technological advances, today’s pickup trucks offer, a truck is more than just a tool for carrying heavy objects. Modern pickup trucks are adaptable, as they can adjust to any situation they are placed in. Today’s pickup trucks have been built to help you confidently tackle any challenge that comes your way. 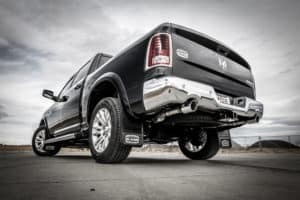 When most people think of the negative aspects of a pickup truck, the first thing that comes to mind is most likely how loud they are or how costly they can be at the gas pump. In today’s society, people are becoming more aware of their carbon footprint, and truck manufacturers are becoming more cognizant of that as well. As such, trucks are now being equipped to maintain better numbers regarding their fuel economy. According to Consumer Reports, the Ram 1500 EcoDiesel is currently the most fuel-efficient pickup truck on the market. In addition to its versatility and fuel efficiency, the countless safety features offered in pickup trucks are allowing these vehicles to become more of a family-friendly options, as opposed to previous years when trucks were only used for working. For example, the 2019 Ram 1500 provides drivers with an abundance of safety and security features, including blind-spot monitoring with rear cross-path detection, trailer detection, a surround view camera, as well as additional safety features as optional add-ons. Due to their size and height off the ground, when compared to other cars, trucks can be safer as they provide a more comprehensive vantage point for drivers. It is because of these multiple safety features that more drivers are choosing to trust the pickup truck to keep their loved ones safe and secure on the road. With the style and up-to-date technology of a pickup truck, drivers are able to stay more connected in their travels than ever before. The roomy interior and comfortable seating provide a truly enjoyable riding and driving experience that will leave you impressed. The dashboards of most trucks look like an airplane cockpit, with buttons, knobs, screens, and lights. In the 2019 Ram 1500, drivers will be provided with a touchscreen information and entertainment system with Uconnect software that will ensure connectivity on any journey. Now that you’ve read about some features of pickup trucks, it’s time to go and test drive one. See for yourself what makes the pickup truck a reliable and sturdy vehicle that can be customized to fit any lifestyle.